(WINDSOR, ON) – The Windsor Returned home in their attempt to avoid being swept by the St John’s Edge in their best-of-three Round 1 series. With the Edge leading 2-games-to-0, even a 37-point night from Maurice Jones, and six players in double figures, couldn’t shift their fortunes. Demontre Harris won the contested opening tip and Shaquile Keith fed Chad Frazier for the game’s first bucket. Facing elimination, the Express needed to make each trip up court count toward their benefit. Frazier’s score, however, accounted for the only points of the game, until Logan Stutz dropped a short jumper from the paint at 8:25. The teams settled down and began score more consistently after Jones knocked down a 3-pointer to break the trend. Coming back from the media timeout, former Express forward Wally Ellenson returned the favour, and a sprawling Keith set up Harris from the floor for a two-handed slam. The Edge took the lead with 3 minutes left on the clock and expanded it to 4 points, 17-13, until Jones dropped a dagger from well out to bring Windsor back into contention. The lead changed hands again when Jones’ seeing-eye pass to Stutz in the paint resulted in a pair of points. The crowd really came alive when Sefton Barrett took control of an errant Edge pass, completed with a statement jam. Two triples from Braylon Rayson was followed by one from Barrett and Windsor went on a 20-4 run, which was well received by the home town fans. At the quarter, Windsor enjoyed a 33-21 margin. After the starting dry run, both sides improved their shooting in the period to 56% and 53.3% for Windsor and St John’s respectively. “Tonight’s game was a tough game,” Windsor head coach Bill Jones said. “When you get a 13-point lead you want to take command of it. And we ended up giving it back to them. The Edge reversed their luck coming back from the break and quickly regained 13 points to Windsor’s 6. Coach Jones searched for the player combination that would stem the St John’s tide. A foul and a technical to the Edge’s Grandy Glaze allowed Stutz the opportunity to sink three from the line for another lead change. The teams rushed neck-and-neck to the halftime horn where Windsor found themselves with a slight 59-58 advantage. Toward the latter half of the period, Windsor fans were treated to a first rate display of ball movement which had the St John’s players scrambling to cover. The teams retired to their respective dressing rooms under a hail of boos from the fans, though, after a questionable charging call waved off a bucket by Kevin Loiselle. The Edge exploded on a 13-6 run to open the 3rd quarter. Slowly, however, Windsor clawed their way back into the game until Ellenson took over. Too many open looks for the Wisconsin native resulted in 3 after 3 for the Edge. Ellenson ended the game 6-for-6 from 3-point range and 20 points total. The Express faced a serious uphill battle going into the 4th frame. Behind by 13 and the season began to ebb, but not the desire to get back into the game. Down by 10 with 5 minutes to play, Windsor pulled out all the stops. Jones dropped a trey to help the cause but Carl English earned a basket and a foul to negate the effort. Glaze then threw the ball away and Keith got 2 on a third chance conversion. A miss by Charles Hinkle allowed Windsor to pull within 7 with 3:44 on the clock. English then gave the ball away and Keith won a call deep in the St John’s end. Rayson hit for 3. It came down to a matter of too many missed shots as Windsor bowed out of the playoffs in three straight, 124-117. St John’s will now move on to play the winner of the London and Niagara series. 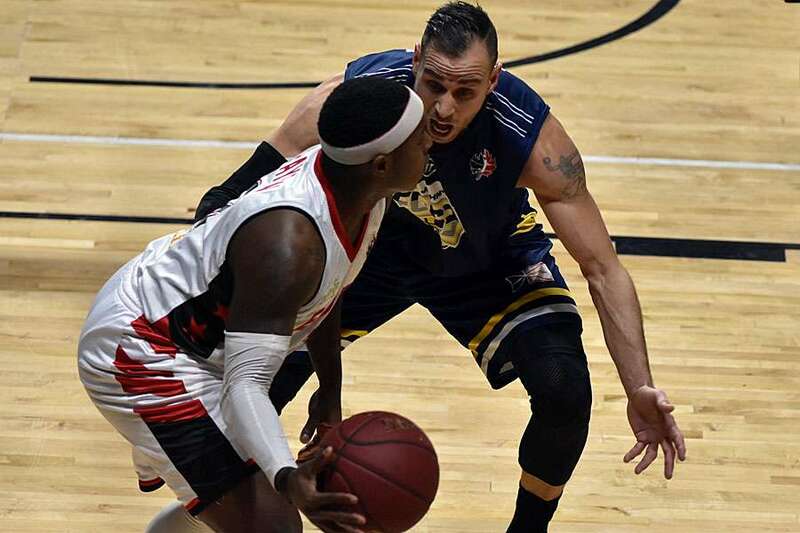 The River Lions staved off elimination with a 124-115 win Tuesday night at home. However, it is too early to know what the future holds in store for the Express, though Jones reflected on the year.